Submitted by Alexander Briones on Sep. 3, 2018. First published on February. 25, 2016 and last updated on September 3, 2018. Vocal effects pedals and processors continue to be in demand, thanks to improvements in smart harmony and pitch correction technology that are now useful on stage. Here we feature current market favorites, updated for 2018, covering pedals and tabletop vocal processors that are meant for live performance use. In addition to pitch correction and harmonization, these top rated processors are useful for adding other effects like reverb and compression, or for totally transforming your voice - be it robotic/alien like sounds, different age or gender, and many more. They serve you much like a team of virtual sound engineers, vocal coaches and backup singers, all packed in one unit. Below are the processors that garnered top ratings and recommendations from users and experts alike, covering everything from multi-featured processors to compact single pedal size units. With the success of the TC Electronic Ditto looper pedal for guitar, it's only natural for their sister company, TC Helicon, to cash in on the hype with their own take. The TC Helicon Ditto Mic Looper follows after the original Ditto looper pedal, with its straightforward controls and compact profile. Sporting just a single loop level knob and two footswitches, it doesn't take long to master its controls, which include record, play, stop, erase, undo and overdub. Ease of use and affordability are traits that make the TC Helicon Ditto Mic Looper ideal for those who want to test the waters of vocal mic looping. Paul White of Sound on Sound is just as impressed with its simplicity: "While there are more sophisticated loopers on the market, I like the way the Ditto Mic Looper sticks to the essentials — you’re so much less likely to get into a mess when using it! In addition, factoring its portability, makes it ideal even for experienced users who want a compact looper. Not many complaints about existing features, but there are a few who are looking for more, specifically longer looping time. But its limitation and simplicity is exactly what makes it appealing to others who want something that's efficient and practical. 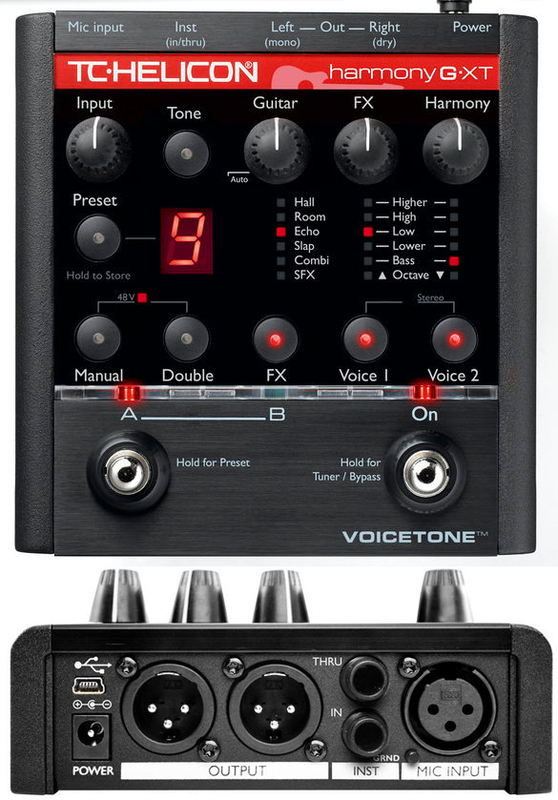 The VoiceTone Harmony-G XT is designed specifically for the purpose of producing accurate and natural sounding harmonies, primarily targeting vocals with guitar backing. It takes advantage of the popularity of smart harmony effects, which gives you virtual back-up singers. The harmony algorithm of this unit is designed to adjust the pitch of the backing vocals depending on the chords being played. This results in accurate harmonies that don't have to be programmed in advance, and the harmonies can follow you even when you modulate or change keys. The obvious caveat is that you have guitar accompaniment although some report that it also can work with other chord playing instruments such as keyboards. Alternately there's also an option to set the pedal to use the key or scale that you'll be singing in. Another cool feature of this pedal is the "Auto Chromatic Pitch Correction" which subtly adjusts your singing pitch to match the chords your playing, I doubt it can save you from big pitch lapses but it can clean up microtonal differences - which in the end makes you sound good. Some reviewers feel that the features are a bit limited, but it does carry essentials like reverb and it automatically adjusts EQ and dynamics. For the price, you're getting more than your money's worth, especially when considering all the extra features. With its impressively high ratings, this backup-singer-in-a-box gets our thumbs up. The TC Helicon Perform VG is a vocal processor that's meant to provide smart harmonies and pitch correction for singers who play guitar. It does this by analyzing the chords you are playing and formulating harmonies as you move from chord to chord. Instead of the usual pedal form factor, this mounts on a mic or guitar stand for easy access on stage. There are also other essential effects that can be accessed, including auto-chromatic pitch correction, reverb and echo, compression, adaptive EQ, de-essing and gating. It also comes with anti-feedback processor when you need to go loud on stage. Another cool feature of the TC-Helicon Perform-VG is the BodyRez guitar effect, which helps improve the overall sound of your acoustic guitar. The TC-Helicon Perform VG's distinct stand mounted profile and extensive functionality are its most commended features. Singers are especially fond of switching between different harmony styles while performing. The built-in guitar effects are also well appreciated, along with the overall sound quality of the unit. A few users gave slightly lower scores because they find it hard to change settings while playing guitar. They wish that it came with a footswitch controller, which many report to increase the fun you can have with the vocal processor. If you're looking for a non-pedal mic stand mounted vocal processor then check out the TC-Helicon Perform-VG. 88 out of 100. Incorporating 550+ ratings and reviews. The VE-20 showcases what Boss is all about, packing as much sound quality and as many features inside a compact and robust metal enclosure as they can. This unit follows Boss' dual-pedal multi-effect profile, which they implement on many of their guitar effects, only this one is meant for vocalists to enjoy. As expected, basic delay and reverb effects are included for adding subtle ambience to your voice. But you can also use it to go all out with pitch-correction and modern auto-tune effects as used by artists like Black-Eyed Peas and even Cher. Other effects include a programmable harmony, that follows after a specific keys and scales and a 38 second looper that can let you craft your own vocal blending. 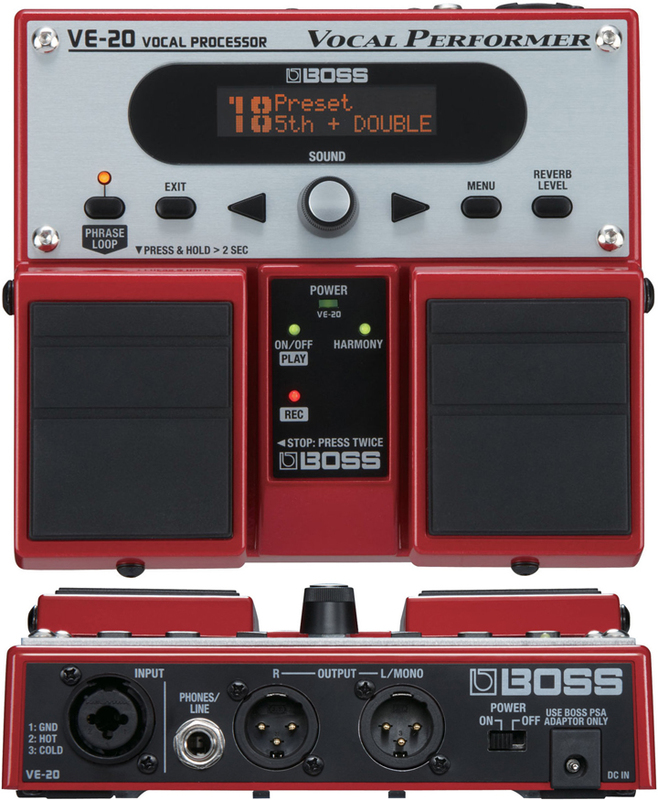 Finally, Boss incorporated cool extra effects that include chorus, distortion robot, strobe and more. There's just no denying the success of the VE-20 as a compact multi-effect solution for vocalists. To this day, it continues to get consistent positive reviews and ratings, with reviewers agreeing on two important things - that it sounds great and that it is built like a tank. Having been made by Boss, this effect can handle the rigors of the road and will probably last you a lifetime. One minor concern about this pedal is the short optional power cord that you need to buy separately, a quick solution to this is to get it on purchase of the effect and have an extension cord ready. Get the Boss VE-20 if you're looking for a compact reliable vocal effect pedal. 88 out of 100. Incorporating 275+ ratings and reviews. The name itself is a big giveaway that the TC-Helicon VoiceLive Play Acoustic is meant for singers who play acoustic-electric guitar. It combines TC-Helicon's popular vocal effects with TC-Electronic's popular acoustic guitar effects in one convenient package - with separate dedicated controls and input/output jacks. The vocal section features a mic preamp and familiar effects that include smart harmony, dynamic processing, reverb, echo and pitch correction. The guitar section features TC-Electronic effects like the Hall of Fame Reverb and Corona Chorus, as well as EQ tone shaping and feedback suppression. There's also a nifty "BodyRez" feature which automatically optimizes your acoustic-electric guitar sound, to give it more body and presence, making it sound more like a miked acoustic. If all of the above features are not enough, the latest firmware update of the VoiceLive Play acoustic adds TC Electronic's popular Flashback Delay effect into the unit. In addition to effects, this processor also incorporates looping features. Users describe the TC-Helicon VoiceLive Play pedal as a great live performance tool, some even describe it as life changing because of how it improves both their voice and their overall performance. Some users found the interface to be a bit confusing, but were able to make full use of the pedal's features after giving it some time and practice. If you're looking for a pedal that gives you the best of both worlds (vocal and acoustic guitar effects), then the TC-Helicon VoiceLive Play Acoustic is highly recommended. 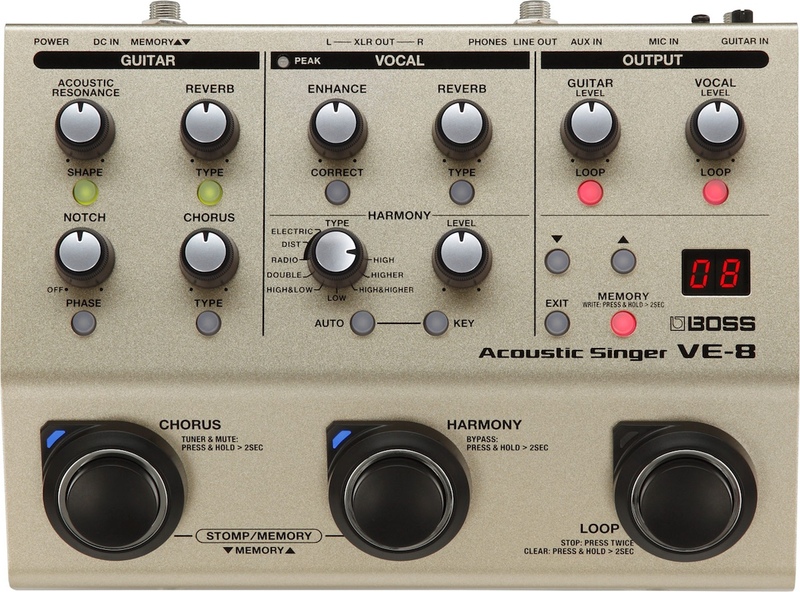 More than just a vocal effects pedal, the Boss VE-8 Acoustic Singer is an all-in-one preamp and effects solution for vocals and acoustic guitars. It starts off with dedicated preamps for mic and guitar, both of which come with independent effects, of which the microphone side is of particular interest because of its myriad of features. This includes essential effects like reverb and smart harmony, while also incorporating experimental ones that include distortion, robot and other electronic effect types. The guitar side of the pedal is just as packed, with built in modulation effects, delay and a nifty "acoustic resonance" effect that improves the sound of piezo equipped acoustic-electric guitars. Reviewers describe it as an amazing all-in-one pedal, and commend it for catering to both traditional and adventurous singer-guitarists. While it gets most of its thumbs up from its quality mic reverb and harmonies, it also impressed a lot of guitarists. There were a few who were not satisfied with some of the extra guitar effects, but still loved the Boss VE-8 overall. Check this out if you're looking for a gig-worthy vocal and acoustic guitar effects pedal. One of the most prominent features of many vocal processors is the ability to add one or more harmonies to a part being sung. Many of these can use guitar or instrument inputs to automatically change the harmonies to fit the chords being played and the note you're singing - a feature we are calling 'Smart Guitar-Controlled Harmony'. Without this feature you need to manually set the key for each song and change patches if you want to adjust the interval of the harmonies within that key. The number of simultaneous harmonies varies between pedals, offering between 1 and 4 additional voices. You can often tweak the character of the harmonized voices in various ways including pitch and timing variations and even gender. Pitch correction has taken some genre's of music by storm and it's not just being used to fix tuning problems but also for its own distinctive sound. It can be handy if you're looking for some discreet help with a few tough songs or want to sound like T-Pain, Kayne West or any number of popular artists. You can usually control how pronounced the effect is of pulling the pitch of your voice toward to the desired note. If you're looking for a natural sound then a lower speed and amount of correction is usually better. The 'Hard Tune' effect locks the pitch to a target note very quickly which produces that artificial sound and can result in a rapid warbling if you drift between notes. Most vocal processors allow you to set a scale to tune to but generally chromatic mode should be sufficient if you are getting anywhere near the note. However the scale setting can be useful for that pronounced hard tune warbling effect to control which notes it warbles between. A big part of the reason many people use vocal effects pedals is to be able to have consistent control of the basic vocal effects such as compression, EQ and delay/reverb rather than be at the mercy of the mixing desk. To that end some pedals only offer these core effects. Others who are in more experimental styles of music will appreciate vocoder, synth, alien, robot and other out-of-this world voicings. Many of these processors also allow changing the character of the voice using "formant shifting" effects to deepen or lighten the character of the sound and go as far as to artificially change the apparent gender and/or age of the singer. These effects have become common in popular music and are often being used for their tonal character rather than just keeping the singer in tune. They can also be used in conjunction with harmony for male/female voice style backups. Since many vocal processors use guitar input for their smart chord-based harmonies, manufacturers have been adding guitar effects so singer/guitarists can use this as an 'all in one' performance unit. Generally these effects are tailored towards acoustic players offering the basic reverb, delay and possibly modulation, EQ/Filters and more. You'll want these features if you're a singer who also plays guitar, and want to keep your rig simple. While most vocalists will use just a basic XLR connection into a PA or mixing console, those that sing and play guitar at the same time may need dedicated outputs for guitar and vocals. That way the guitar can be routed separately to the guitar effects/amp while the vocals can go straight to the PA. Direct USB recording capability is another nifty feature in this age where live streaming and online video/audio platforms are widely used. We put Gearank.com's ratings algorithm to its paces yet again, this time processing over 3400 of the most current reviews, ratings, customer feedback, forum posts, expert reviews and many more to come up with a list that better reflects 2018 market sentiments. In addition to the scores, we also provided detailed descriptions, key features and notable pros and cons. For more information about this process see How Gearank Works. Submitted by raphael (not verified) on Nov. 27, 2016. Hey! Thanks a lot for these great lists. I was wondering about the TC-Helicon VoiceLive Play GTX. Do you have an opinion about it? Submitted by Jason Horton on Jul. 10, 2017. Submitted by Noushad (not verified) on Aug. 4, 2017. Recommend me a best iOS Smule sing interface setup . I'm using a Tascam iXZ right now. A vocal mixer will be good to go. Submitted by Jason Horton on Aug. 5, 2017. Here's an iOS compatible interface with built in mixer and mic preamp: Yamaha AG03. Submitted by roy biggin (not verified) on Oct. 9, 2017. Do any of these have a vocal vibrato? Submitted by Jason Horton on Oct. 10, 2017. I haven't seen the term 'vocal vibrato' used in relation to any of these effects units, but the Boss VE-8 does have Tremolo if that helps. Submitted by Jason Horton on Oct. 24, 2017. Today we removed the TC Helicon Harmony Singer from our list of recommendations above due to a lack of availability. Submitted by MidCalBassman (not verified) on Nov. 6, 2017. Thanks for the to the point and easy to take in reviews. This did help me make a purchase decision. Roland Vocal GTX. BTW - The G XT is made by TC-Helicon rather than Roland. Submitted by Mikey Fdo (not verified) on Nov. 21, 2017. I am looking for a small unit similar to BOSS VE20 that can be connected to a keyboard via midi to get the exact key changes for harmony and pitch correction. HELP! 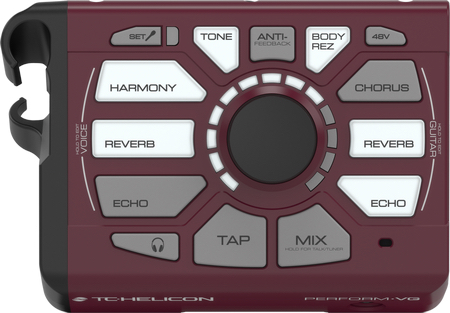 There are no small units that we recommend that have that feature - the nearest is the full sized TC-Helicon VoiceLive 3 which allows MIDI control over pitch. Submitted by Didi (not verified) on Dec. 5, 2018. Submitted by chris (not verified) on Jan. 29, 2018. Are there any that can get chords for harmonies direct from tracks instead of guitar or keys? The pedals don't specify this feature, but it can probably be done if you route pre-recorded tracks to the guitar input. There are other many apps that can do this though, but you'll have to figure out how to get them to trigger the harmonies off of your pedal. Submitted by Joe (not verified) on Feb. 14, 2018. I have seen many reviews on the above effects, but the one thing that no one has mentioned so far, is, if you can patch one of these effects into a mixer to be used by more than one vocalist , e.g on several channels of a mixer or does each vocalist has to have their own effects unit? These types of foot pedal effects are primarily designed to be used by a single performer on stage rather than be used as outboard effects with a mixing console. You could conceivably use some of them with the effects loop on a mixing console, however only the ones with 1/4" ins and outs would be usable, and the person mixing might find it awkward using the switches that are meant to be foot operated. Typically, with mixing consoles, you would use rack mount effects units instead. Submitted by Tom (not verified) on Mar. 2, 2018. I’m trying to get a late 70’s early 80’s stereo effect. Does anyone know if one of these can achieve that? Submitted by Alexander Briones on Apr. 16, 2018. Most likely they were using a rackmount studio chorus effect. This can be achieved via the average chorus effect, which is included in many vocal and looper pedals. Now if you want to really capture the flavor of the classic chorus, you'll have to research on the actual gear that was used on the recording that you're trying to replicate - and utilize something that's similar sounding, be it actual hardware or digital effects. Submitted by Bill (not verified) on Mar. 13, 2018. Is there any pedal that you can choose a specific mode and not just major/minor? I perform lots of folk songs and would love a pedal I could set to the pentatonic scale. Submitted by Alexander Briones on Apr. 17, 2018. Many harmony pedals allow for either automatic and manual key/scale mode, but I have yet to see one that specifically limits harmonies to the note of the pentatonic scale. In any case, the pentatonic scale is just a few notes less than the major and minor scale setting, so you can achieve a similar effect with them - albeit with some of the harmonies going outside the pentatonic scale. Submitted by Eva (not verified) on Mar. 23, 2018. Thank you for the article! I am less after effects and more after intuitive and easy to use sampler for vocals and speech. Do you know which direction I should look? If what you mean by sampler is looping vocals, then you can go for any of the compact ones with built-in looper, like the Boss VE-20. But if you want an easy-to-use pedal to improve your overall sound, then get the Mic Mechanic from TC-Electronic. Hey.. Thnx for all this great info! Still playing every day with the Roland 501. ( sultry and melodic type of improv flute ) The pre on this Roland is special. Which one comes close in quality to the Re 501? Just need the basic effects / delay /reverb. Trying to look for a compact alternative to the Roland RE-501 is a tall order. So if you're looking for a vocal effects pedal with RE-501 like quality delay/reverb, you may have to lower your expectations. And If you do, you'll find that many of the pedals listed here can provide workable, if not good reverb and delay. Submitted by Kenny Burch (not verified) on Sep. 24, 2018. With a lot of the best processors being taken off of the recommended list, what processor is currently the the best and is a available? The recommended list above does represent the best that are currently available. The TC-Helicon VoiceLive 3 came off the list because it has been discontinued and the TC-Helicon Voicetone Mic Mechanic 2 came off the list because the other ones we now recommend have higher ratings which are represented by their Gearank scores out of 100. Submitted by Nicolas (not verified) on Nov. 10, 2018. Hi! Great guide. About TC Helicon Perform VG, it has Phantom power (can't be phantom powered, but you can power a condenser mic with it). Also the USB port is just for firmware update, not able to direct recording or control. Submitted by Jason Horton on Nov. 12, 2018. Thanks for that, you are entirely correct! There were some confusing phantom power specifications on the TC-Helicon website so I checked the manual and have updated the Phantom Power and USB specifications above.